Oil prices remained under pressure Tuesday, a day after a sharp, sudden drop that had traders scrambling and economists scratching their heads. The October contract for U.S. crude closed down $1.33 to $95.29 a barrel. On Monday, the price of light crude dropped $2.38, or 2.4%. 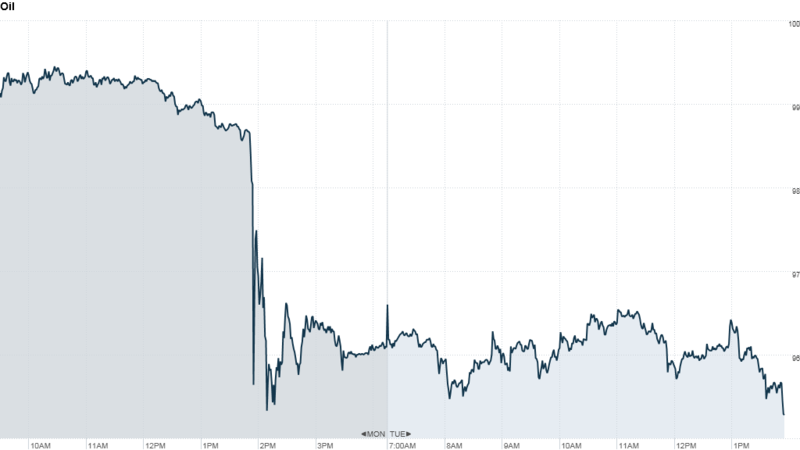 The contract had tumbled more than $3 in less than a minute late in the session before recovering some of its losses. "Energy prices were extremely volatile yesterday," wrote commodities analyst Stephen Schork, editor of The Schork Report. "The crude oil contract took a swan dive in the late afternoon despite a dearth of fundamental or economic news releases -- did another fund just explode?" Schork theorized that the plunge in oil prices might have been caused by several factors, including the pending expiration of the October contract, and Monday's drop in stock prices. But he said there was no obvious reason for Monday's sudden selloff. Theories for it included speculation that oil would be released from the Strategic Petroleum Reserve, but there was no confirmation that a drawdown had taken place. Schork said there was also speculation that the U.S. Oil Fund had liquidated a large position, or that a trader had made a 'fat finger' mistake by accidentally selling oil for a fraction of its worth. But Tom Kloza, chief oil analyst for the Oil Price Information Service, doesn't subscribe to the fat finger theory. He said that many of his colleagues believe the price plunge was "an algo," market slang for algorithm, meaning that several large trading houses might be using similar mathematical formulas to trigger selloffs at the same time. Related: Will turmoil overseas hurt my retirement portfolio? Some analysts, including Kloza and also Phil Flynn, senior market analyst for the Price Futures Group, believe that oil was overpriced. They said traders were stocking up in the belief that violent protests in North Africa and the Middle East that killed a U.S. ambassador in Libya would continue throughout the weekend. But the weekend protests were not as violent as expected, making the inflated prices vulnerable to a selloff. "Bearish things like unrest in the Middle East had already driven up oil prices," said Flynn. "The market has been preparing for a disruption in the Middle East for the last year and a half." Meanwhile, the price of gasoline slipped for a fourth consecutive day, to a nationwide average of $3.859 per gallon of regular, according to the motorist group AAA.